The recent trend in the Indian market reflects on the customers’ affinity towards scooters. They are a medium of easy commuting in congested traffic while delivering impressive fuel economy. Moreover, the prospect of hassle-free riding, without having to change gears, is the signature characteristic. The new-age customers have fallen into a special category as they delve on strolling around in scooters with funky appearance. It has given rise to premium scooters that are sporty as well as performing better on roads. On hindsight, the government’s tax relaxation and compulsion to curb the soaring pollution levels will put the emphasise on electric mobility. It will in turn highlight on electric scooters as highly accessible solution and already the mainstream manufacturers as well as several ambitious startups are in line to come up with new products. 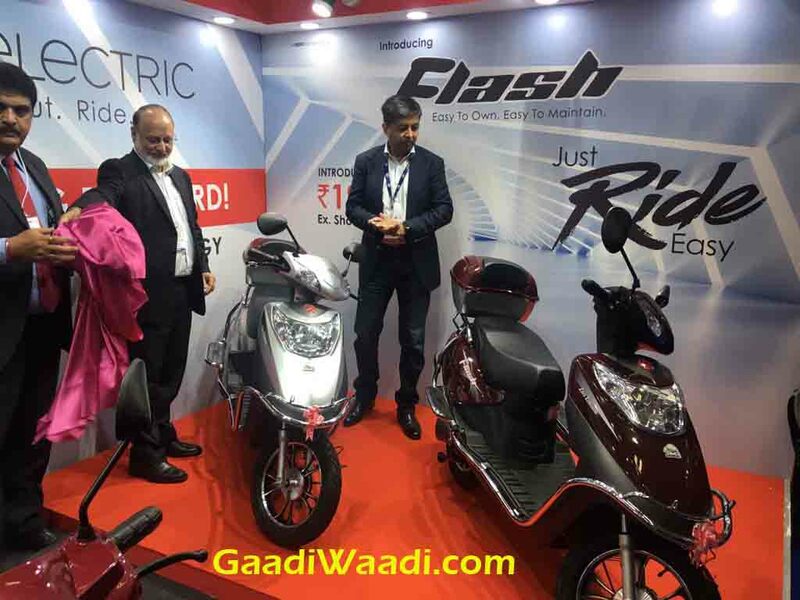 Hero Electric is a pioneer in the industry and at the Green Mobility Expo it has introduced a new e-scooter called Flash with its traditional point of affordable pricing. The company believes this scooter will catch attention of the customers who want to buy a vehicle that is environment friendly and doesn’t cost much. 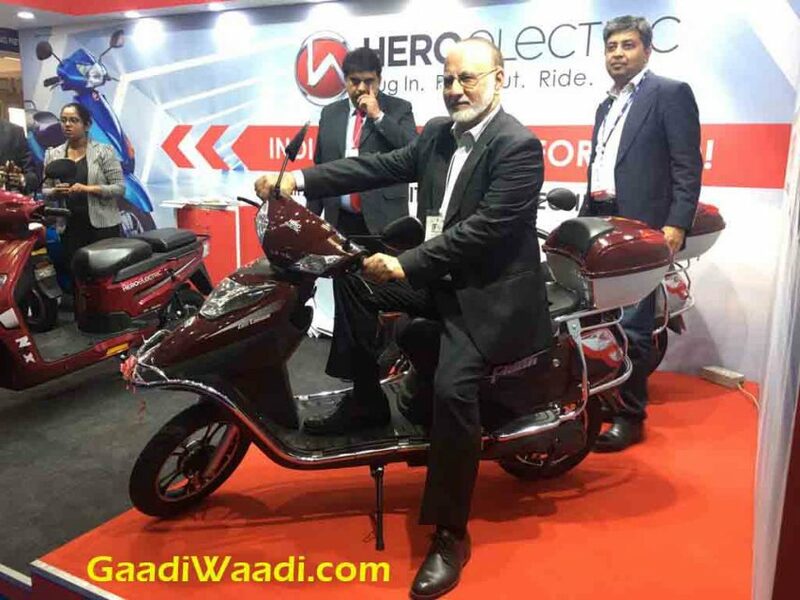 Speaking about the product, Mr. Sohinder Gill, CEO of Global Hero Eco Group has said, with Flash e-scooter the company wants to move further ahead towards making India an electric mobility nation. 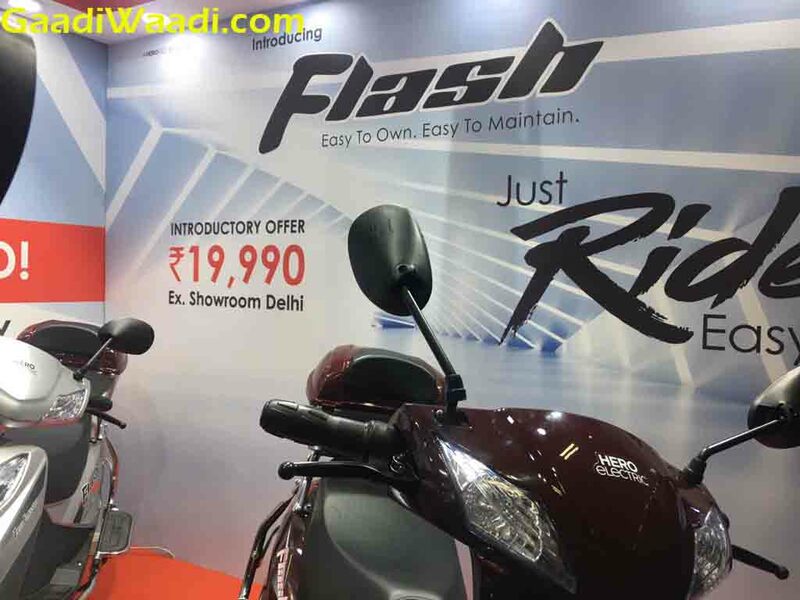 Hero Electric has launched the Flash electric scooter at Green Mobility Expo in Delhi recently. The e-scooter comes available at an introductory price of Rs. 19,990 (ex-showroom, New Delhi). The price carries government subsidy of Rs 14,000 for electric vehicles as it is co-developed by Hero Electric with Department of Science and the Society of Manufacturers of Electric Vehicles (SMEV). It will be available across Hero Electric’s 350 dealerships within a month. It is powered by a 250 watt electric motor combined with a 48 volt 20Ah VRLA battery. This electric powertrain delivers a running range of 65 km on a single charge. The battery needs around 6-8 hours to be fully charged and the scooter is claimed to be capable of delivering a top speed of 25 kmph. Hero Electric could offer a lithium-ion battery equipped Flash in the coming few months which would price it at around Rs 15,000-20,000 difference compared to the existing model. The Hero Flash e-scooter sports a large beak like front cowl and the headlamp is positioned at the centre of that. Up above, it gets the conventional turn indicators. It also comes with a spacious footboard for the rider and the seat offers a comfortable experience. Overall, the Flash e-scooter looks pretty attractive indeed. The Hero Flash has been built targeting those customers who are the first time electric vehicle buyer. It is available in two different colour combinations – Red-Black and Silver-Black. Hero Electric claims that the lightweight scooter is easy handle as it weighs only 87 kg. It runs on 16-inch magnesium alloy wheels and sports a full-body guard, a telescopic front suspension, short-circuit protection and storage space below the seat. It has been designed to offer even the first-time riders a comfortable experience.